Cardiac Electrophysiologist. Atrial Fibrillation Specialist. Cardiac Electrophysiologist. The physicians at Atrial Fibrillation Center Of America Atrial Fibrillation Specialist pride themselves as being advocates for patient needs and have established their practice as an example of the highest quality arrhythmia care available. Cardiac Electrophysiologist. Atrial Fibrillation Specialist. Cardiac Electrophysiologist. 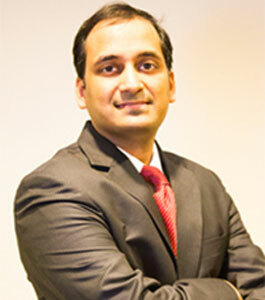 After completing his Biomedical Engineering and Computer Science degree at Johns Hopkins University, Baltimore, MD in 2000, Dr. Bansal entered medical school at Rush Medical College, Chicago, IL where he received his MD degree in June 2004. He then completed his residency training including specialized research in cardiovascular medicine in 2007 at the University of Chicago. Following residency, he entered a Cardiology Fellowship at Yale-New Haven Hospital, New Haven, CT where he focused on nuclear cardiology and electrophysiology, finishing in 2010. He then entered a Cardiology Fellowship at Harbor-UCLA Medical Center/Good Samaritan Hospital, Los Angeles with advanced academic work in ablation techniques and devices. He completed his studies at Harbor-UCLA in 2011. Dr. Bansal currently practices clinical electrophysiology treating patients with arrhythmia and cardiac issues at the Atrial Fibrillation Center Of America medical practice serving northwest Houston. His specialties include atrial fibrillation ablations as well as proficiencies in device implantation/management and ablation techniques. He is board certified in Internal Medicine (2010), Nuclear Cardiology (2011), Cardiology (2011), and Electrophysiology (2013) and served as an electrophysiologist with Houston Arrhythmia Associate from 2011 to 2018. In order to provide a greater level of care, Dr. Bansal founded Houston Heart Rhythm and Atrial Fibrillation Centers of America. Presently, Dr. Bansal is affiliated with multiple hospitals including Methodist Willowbrook Hospital, North Cypress Medical Center, Houston Northwest Medical Center. Dr. Bansal has an extensive list of research publications, abstracts, and presentations to his credit and is a member of numerous professional and academic societies including the American College of Cardiology and the American Heart Association. Dr. Bansal’s medical philosophy is centered on establishing care driven, the one-on-one doctor-patient relationship which affords each patient the highest levels of cardiovascular disease diagnosis and treatments. He believes that delivering compassionate care is the highest calling of the medical arts and conducts his practice based on this philosophy. Dr. Bansal is available for consultation at Atrial Fibrillation Center Of America located at 13325 Hargrave Rd #280, Houston Tx 77070. Atrial Fibrillation Center Of America provides a broad range of electrophysiology diagnostic and treatment care for patients from across Houston. For an appointment, contact Atrial Fibrillation Center Of America’s main office number, (832) 478-5067. Dr. Khuyen Do complete his undergraduate work at the University of California, Irvine, CA in 2005 and attended medical school at the Albert Einstein College of Medicine, Bronx, NY receiving his medical degree in 2009. Following undergraduate and medical schools, Dr. Do completed his internship and residency at the LAC-USC Medical Center/University of Southern California Keck School of Medicine, Los Angeles, then completed a Cardiology Fellowship (2013-2016) and an Electrophysiology Fellowship (2016-2018). Both fellowships were at the LAC-USC Medical Center/University of Southern California Keck School of Medicine. He also served one year (2012-2013) as Assistant Professor of Medicine at the Hofstra Northwell University School of Medicine in Hempstead, NY. 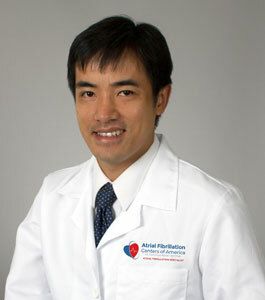 Dr. Do specializes in electrophysiology and cardiovascular medicine with a focus on ablation procedures for the management of atrial flutter, supraventricular tachycardia, atrial fibrillation, PVC, and ventricular tachycardia. He is skilled in arrhythmia control devices and procedures including cryoballoon and radiofrequency ablation, as well as implantation of transvenous pacemakers, leadless pacemakers, ICD, CRT, S-ICD, CardioMems, left atrial appendage occlusion devices, and laser lead extraction. Dr. Do offers each patient the highest degree of compassionate care and works to build a close doctor-patient relationship to provide exceptional levels of diagnosis, treatment, and continuing health maintenance. Dr. Do is Board Certified in Internal Medicine (2012), Echocardiography (2015), Nuclear Cardiology (2016), Cardiovascular Medicine (2016), and Electrophysiology (2017). In addition, he has published numerous professional papers, articles, and abstracts, as well as given many presentations and lectures. Dr. Do is fluent in English and Vietnamese and commits a portion of his time to volunteer service projects such as the Project Vietnam Annual Medical Mission to Vietnam, providing medical services to underserved Vietnamese population in Orange County, California, and serving as a Troop leader for the Boy Scouts of America in Orange County. As a practice partner with Atrial Fibrillation Center Of America medical practice, Dr. Do is seeing patients within both a traditional and concierge approach. First and foremost, however, Dr. Do’s believes his mission is to deliver the highest level of patient care in the area of electrophysiology and management of atrial fibrillation. To arrange a consultation with Dr. Do, please call our main office number, (832) 478-5067. Hania Tofik is a Board Certified Adult Nurse Practitioner in Atrial Fibrillation Center Of America. Ms. Tofik began her career in 1999 in Centennial College in Toronto. She completed her nursing diploma in 2002. In 2011, Ms. Tofik perused her Bachelor of Science in Nursing from the University of Texas at El Paso, and her Master of Science in Nursing from the University of Texas Medical Branch, Galveston, Texas in 2015. Her academic focus was a specialty in Adult-Gerontology Nurse Practitioner. She holds certifications as a Registered Nurse – Adult/Gerontology in the State of Texas, AANP Certification in Adult/Gerontology, and Advanced Cardiac Life Support. After she completed her nursing diploma in Centennial College, Ms. Tofik served as a Registered Nurse at the Toronto East General Hospital (2002-2003), then relocated to Virginia to work as a Registered Nurse in cardiac unit at the Virginia Hospital Centre, Arlington, VA, (2003-2004). Finally, she and her family moved to Houston where served as a registered nurse in St. Luke’s hospitals and worked in a cardiac unit from 2004 to 2016. While she was working at St. Luke’s she participated in research project for heart failure and help to implement a program to reduce hospital readmission for heart failure. She also worked part time as Registered Nurse at the M.D. Anderson Cancer Center, (2006-2008). After she completed her MSN in UTMB, she joined Baylor College of Medicine From February, 2016 to June, 2017. 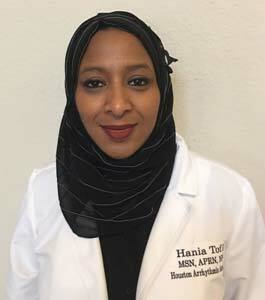 Ms Tofik worked as a Nurse Practitioner at Baylor College of Medicine where she provided direct assessment, diagnosis, and formulation/implementation of treatment plans for cardiac patients. Subsequently, she worked in collaboration with physicians, residents, and fellows to carry out inpatient responsibilities and administer individualized age specific care. She also participated and coordinated a clinical trial for atrial fibrillation. In June of 2017, Ms. Tofik joined IBN Sina Foundation, an organization dedicated to providing affordable healthcare plans to individuals, families, and employers within local Houston communities. She provided primary care and preventive care services for undeserved populations. While working in IBN Sina foundation Ms. Tofik participated in multiple health fairs in the community where she provided individualized preventive care services for undeserved populations. Over the course of her career, she has accumulated more than 15 years of experience in the field of cardiac medical nursing. Ms. Tofik brings this extensive experience to the medical practice at Atrial Fibrillation Center Of America in support of Drs. Bansal and Do where she serves as an outstanding nurse practitioner. Ms.Tofik can be reached at the practice’s main number, (832) 478-5067.